I don't believe in Heaven. I believe in Pain. I believe in Fear. I believe in Death. Licking tongues of fierce fire and tinkling looking-glass shards of pebbled glass bring softcore sizzle for the Guns & Ammo set. 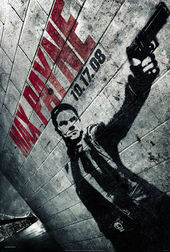 Picture Mill’s vision for the end titles for Max Payne feature a locked and loaded font worthy of Thor that has you in its sights like a well oiled Reagan-era action flick. Bullet holes as full-flooded spotlights! Well worn gunmetal in recoil! Mayhem ensues.